February 12, 2019—Check out our infographic, prepared by collaborator Marc Cho, summarizing the reach of our reporting on Rio de Janeiro’s favelas in 2018 below. RioOnWatch is our award-winning, bilingual community news site and the heart of Catalytic Communities’ communications strategy. Through RioOnWatch, we seek to shift the narrative on favelas and engender nuanced, productive, and accurate coverage through resident perspectives. Our network of writers—consisting of community journalists, international observers, academic collaborators, and more—reports on local policy, grassroots organizing, and community issues so as to inform municipal decision-making, mainstream favela perspectives, inspire collaborative and sustainable development, and engender the large-scale shifts society needs to guarantee the rights of these historically marginalized communities. Readers hail from over 200 countries and include community organizers in Rio and around the world, academics from numerous institutions, journalists from hundreds of publications, urban planners and housing activists, and international development professionals. Over nearly nine years, RioOnWatch has published over 2900 articles in English and Portuguese. 90% of all reporting is done by solidarity reporters, keeping us lean and flexible to respond to community requests for visibility and debate. Finally, 100% of translations are conducted by an amazing network of committed volunteers. Thank you to our readers for being a part of it all. 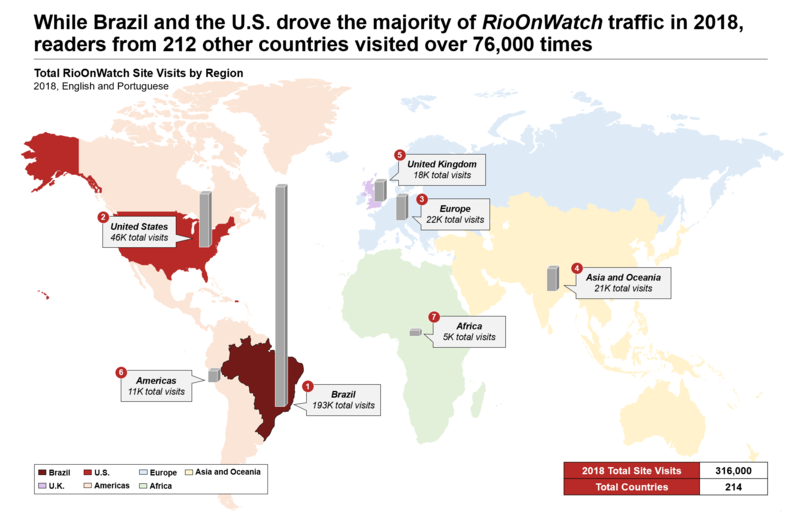 For greater insight, read the recent report ‘Strategic Alterntative Media at the Rio 2016 Olympics,’ by Cambridge University researcher Cerianne Robertson that sheds light on how RioOnWatch does what it does.